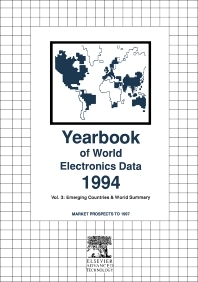 Volume 3 of the definitive Market Reference to global electronics production and markets, with forecasts to 1997. The countries covered in this volume are China, Egypt, Greece, Mexico, New Zealand, Portugal, Puerto Rico, Saudi Arabia, Turkey and Venezuela. The aim is to cover all electronic products and components included in those products. These are grouped into 10 major categories which are common and directly comparable across all countries. Product groupings are further broken down in to sub-categories, the degree of detail of which, however, varies for each country depending on the importance of that product for each country and the availability of statistical sources. In compiling the Yearbook Series, trade statistics are analyzed in detail with over 350 separate catergories being employed. For some of the emerging countries, where trade statistics from a country are limited or unreliable, as in China, greater emphasis has been placed on trade statistics of countries trading with that country. Production statistics are collected from Government and Manufacturer's Association sources where these are available. Extensive use is also made of research reports, company reports, news items and work by other consultants to supplement and cross check the official and semi-official sources. From this "base year" estimates are built up, this being 1992 for the 1994 edition of the Yearbook. Production is then forecast for the next two years and markets for the next five. These forecasts are made in real terms using constant exchange rates and excluding inflation. Forecasts are based on the historical performance of each product, the general economic outlook, and the major growth influencing factors. Each new edition of the Yearbook is fully revised and updated with all sources being reanalysed in each successive edition. For corporate analysts, market researchers, industry watchers, investment professionals, strategic planners and those with an interest in developing their business in or with the electronics industry. Introduction. World Summary Data. Economic overview. Electronics market overview of the major countries. Electronics production 1991-94. Electronics market 1991-97. Emerging Countries Data. Economic overview. Electronics market overview. Electronics trade 1991-1992. Electronics production 1991-1994. Electronics market 1991-97. Country Data. China. Egypt. Greece. Mexico. New Zealand. Portugal. Puerto Rico. Saudi Arabia. Turkey. Venezuela. Appendices. Exchange rates. Guide to the interpretation of the statistics. Guide to statistical trade classifications. Guide to the definition of electronic product headings. Translation of product headings.